What is Leg Cramp Away? How has Leg Cramp Away helped others? How do I use Leg Cramp Away? A leg cramp is a sudden, painful involuntary contraction of a muscle in the lower limbs. These painful knots, often referred to as ‘charley horses’, are caused by muscle spasms. Cramps usually occur in the muscles that cross two joints such as the calf, hamstring and quadriceps. This is a common complaint and frequently occurs at night. The cramp usually lasts from a few seconds to fifteen minutes or more and can be extremely painful. The easiest way to get rid of a leg cramp is to massage and stretch the muscle. Many leg cramps are due to a calcium or magnesium deficiency. A severe case of leg cramps may result in tenderness and even muscle fiber necrosis. Chronic diseases of the motor neuron can also cause recurrent severe cramps. Athletes, triathletes and other sportsmen are most prone to leg cramps. They also occur quite frequently during pregnancy, but the people most at risk for leg cramps are the elderly, those who are overweight and those who are ill.
A lot can be done to support healthy muscles and tendons in the leg. A very important factor is to remain hydrated. This means the fluid balance in your body should be maintained by drinking 8 glasses of water per day and avoiding very salty foods. Drinking plenty of fluid before, during, and after exercise is also key. Stretching helps muscle fibers in the leg to relax and ‘warm up’. It is a good idea to warm muscles up before exercise using moderate stretching techniques, and cooling down stretches after a workout. Never train too vigorously before bed. A healthy diet is also a contributing factor for leg health. Always ensure you are getting enough potassium (bananas are a good source). Speak to your health advisor about getting the correct minerals, vitamins and electrolytes into your body. Natural remedies can also help to support leg muscles, tendons and fibers. In fact, natural remedies have been used in traditional medicine for thousands of years to support the healthy functioning of the limbs. Leg Cramp Away a 100% natural homeopathic remedy formulated for the relief of leg cramps. Leg Cramp Away can be used to safely support healthy circulation and oxygenation of the blood in the muscles, tendons and tissues of the leg, without harmful side effects. This remedy contains a selection of homeopathic remedies known for their ability to address common cramps in the lower limbs. Due to the concentrated tincture formula, Leg Cramp Away Drops are absorbed into the system with ease – exactly when you need it! Calc phos (D6) - a biochemic tissue salt that promotes strength of muscles during times of growth and development. It is also excellent for promoting healthy circulation. Mag phos (D6) - is one of the 12 Biochemic Tissue Salts and is very useful in maintaining rested limbs. Mag. phos also addresses an adequate absorption of Magnesium into the system. Rhus tox (6C) - a natural homeopathic remedy recommended to support comfort in the legs as well as healthy sleep patterns during the night. Nux vom (12C) - this remedy suits those who consume too much rich food or coffee and can be used to address cramps occurring in the legs, often at night. Leg Cramp Away contains no gluten, artificial flavours, colours or preservatives. It is suitable for vegetarians and safe for all ages. 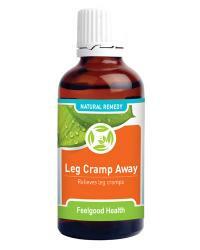 Leg Cramp Away is presented in a concentrated 50ml tincture formula, making it easy to take. Hold bottle upside down and administer 10 drops directly into the mouth. Alternatively dilute 10 drops in quarter cup water and sip slowly. Children under 12 years use 5 drops. Dosage may be repeated every 20 - 30 minutes if needed until symptoms subside. May be used with LegCalm Capsules to support ongoing healthy circulation in the legs. Leg Cramp Away supports the body on a cellular level – helping to support healthy muscles, tendons and ligaments - from the first dose. Leg Cramp Away contains homeopathic ingredients in a tincture formula that facilitates rapid absorption into the system – just when you need it! One bottle of Leg Cramp Away will last approximately 30 days (depending on frequency of use). Soothed legs: Guard against leg cramps plus soothing healing massage therapy!